The CENTRAL region is the area south of the Jezreel and Harod Valleys, but north of a line running from Gaza to Beersheba to Masada — on the shore of the Salt Sea. 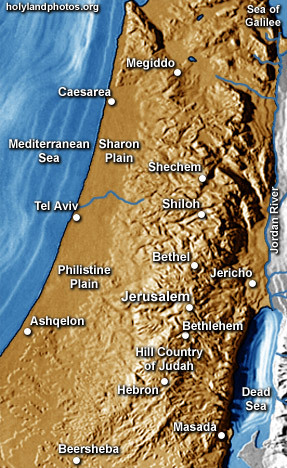 Regions included are: Mount Carmel; Sharon Plain; Philistine Plain; Hill Countries of Manasseh, Hill Countries of Ephraim, Benjamin, and Judah; the western side of the Jordan Valley; the western side of the Dead Sea ; and the Wilderness of Judah. Jerusalem is a separate sub category.